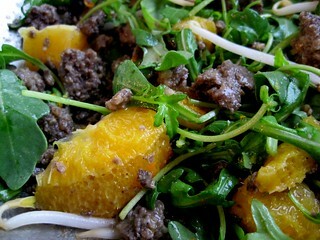 Haggis and orange - why of course! This salad serves 2. The red wine vinegar really helps the flavours marry, and the beansprouts add a nice bit of crunch - if you're being posh you could also/instead add some pomegranate seeds. In a large bowl, break the haggis into small pieces with a spoon. The haggis we had was a little dry so I also added a dab of oil at this point. Now prepare the orange. First, with a zester, scrape off about 1/4 of the orange's zest, into the haggis. Then, with a knife slice the top and bottom off the orange, then stand the orange on a chopping board and slice off the rest of the peel. Then cut the orange into segments, and cut each segment in two, so you have little bite-sized bits. Pick out any pips. Add the orange pieces to the haggis, and also tip in the small amount of juice from the chopping board. Add the rocket and the beansprouts, and mix. Add the olive oil and red wine vinegar and mix it to dress evenly. You won't need to season much, since the haggis brings a lot of seasoning.